It's been a minute since we did a simple side dish on here. Our kitchen time has definitely slowed down a bit with Robert traveling so much, but its been a nice little breather. With Christmas around the corner, I've had a busy mix of decorating, gift buying and recipe planning. Then there's wedding planning. With our trips home few and far between I've managed to sneak in all of the appointments, dress fittings and cake testing into a couple of days before the craziness of Christmas eve is running rampant and my mom is elbow deep in pastizzi dough and antipasto platters. I'm even thinking I'll keep my "fancy pigs in a blanket" tradition going and see just how much extra stuff I can... stuff in there. But back to sweet potato fries. Everybody loves sweet potato fries, and they're amazing all by their lonesome, but even better with sauce. The tangy cilantro lime sauce could be used across a lot of meals (speaking from experience, as the leftovers made their way onto my various lunches throughout the week) and is particularly good to balance the sweetness from the potato. Make sure to repurpose any leftover sauce onto salads or anything else you can think of and you'll be golden. Preheat oven to 425°. 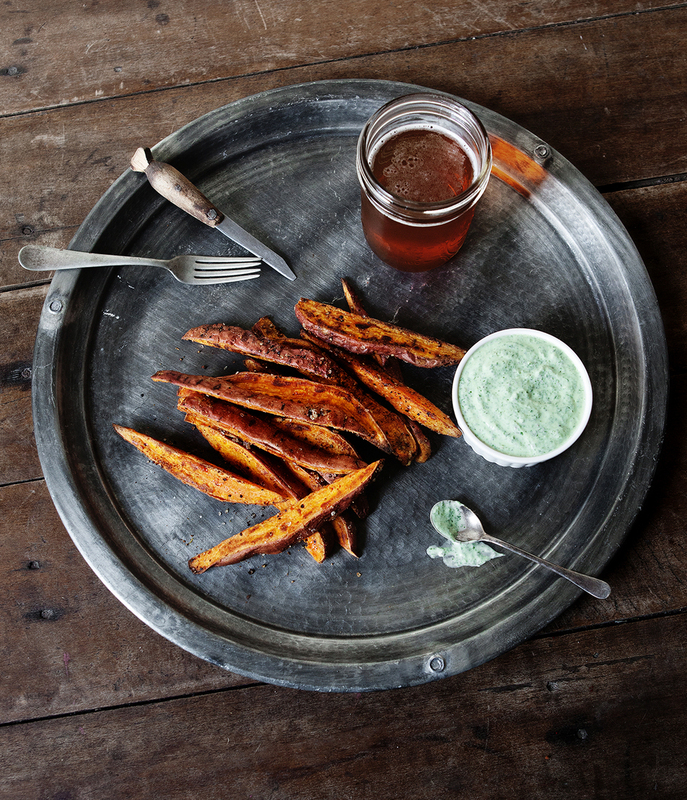 In a large bowl, toss sweet potato wedges with olive oil, garlic powder, cumin, and salt and pepper. Transfer to a well oiled baking sheet and bake for 20 minutes. Flip the potatoes and bake for an additional 10 -15 minutes, until golden brown. In a food processor, combine lime juice and cilantro leaves. Pulse until very finely chopped, about 30 seconds. Add the greek yogurt and pulse to mix for about 30 seconds, scraping the sides of the bowl as you go. For extra creaminess, add extra greek yogurt, one tablespoon at a time until desired consistency is reached. Season with salt and pepper to taste.